One of the joys of having a local patch is its ever-growing familiarity. As you get to know and love a place, you get to know what to expect—or at least what to look out for. There’s great comfort to be found in the familiar: the world can’t have gone entirely to pot if swallows are still hunting for insects in the lea of the woods on the top road; or that small clump of harebells has come into bloom again at the end of the lane. Although I’d never try to pass myself off as even a half-competent naturalist, in the quarter-century I’ve been taking walks on the local moor, I like to think I’ve got to know the place pretty well. I know when to start anticipating the first lapwings of the year, and the best places to look for their tumbling courtship displays. I know when the wheatears are due to return, and which section of wall they’re most likely to visit to flirt with me. And there’s always that brief period to look forward to in August, when the heather is at peak purple, and you could swear you smell honey in the air. As you become more familiar with your local patch, you begin to notice—or possibly imagine—the little things: how rust-red moor-grass is a reliable indicator of a bog up ahead; how the grouse seem to take flight less readily in the colder months, and far more readily as the Glorious Twelfth approaches; how, in autumn or winter, a kestrel can often be seen hovering in the updraught of the edge as sunset approaches. Noticing such things for yourself makes your relationship with your local patch more intimate: the relationship becomes part of your identity. Once you get to know your local patch, you also become more attuned to the unfamiliar or the out-of-place: grouse perching on fence-posts when snow is on the ground; the mysterious wheezing call that turns out to be your first golden plover; the unearthly, what-the-hell-is-that bleating of a snipe’s drumming courtship display. I enjoyed just such a novel experience a couple of weeks ago. It was an inauspicious, cold mid-afternoon. The sun had disappeared behind thick clouds. My legs were more weary than usual after a scramble through one of the quarries in a vain attempt to photograph a grouse I’d seen sneaking up there. But then things improved: I flushed a snipe—a relatively rare sighting—then spent a few minutes admiring a kestrel hunting below the edge. As I climbed towards the top of the edge, a small flock of birds shot past. Little brown jobs: meadow pipits, most likely. When you see small birds flying like that, you should look to see if they’re fleeing from something. Which I instinctively did. And there it was again, the kestrel I’d seen a few minutes earlier, flying along the skyline. But no, something was different. 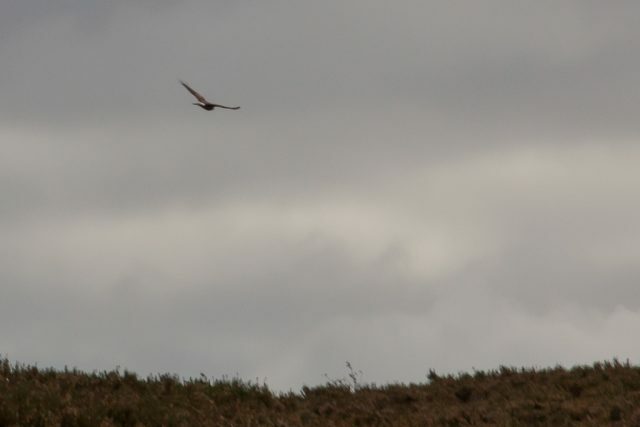 The kestrel was flying wrong, quartering back and forth above the heather. And it was too big. It looked almost like a… HOLY CRAP! A flash of white rump! A female hen harrier: my first in 24 years’ walking on the Moor! I’ve seen one or two hen harriers before, in winter, hunting above the Dee Marshes on the edge of my native Wirral peninsular. But finally getting to see one hunting on my local patch—on my beloved Moor—made the experience intensely personal: something I’d long hoped for, but feared I might never see. The encounter lasted all of ten seconds before the harrier disappeared over the camber of the hill. But I saw one. After all these years, I finally got to see one: a hen harrier—on my own local patch. Very special! You make it so by the way you tell it. Really enjoyed this post. Keep 'em coming!